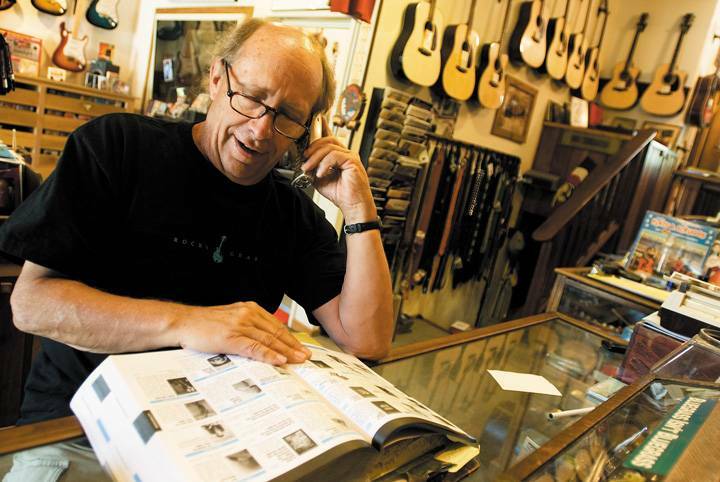 ASPEN ” After 30 years in business, Sandy Munro, bluegrass paragon and local raconteur, has announced plans to sell his Great Divide Music store on Monarch Street. But, unlike so many other Aspen entrepreneurs whose businesses have closed their doors recently, Munro is not getting out because of rising rents, cutthroat business practices or trouble with the tax man. The reason for selling, said Munro, who is 65, is that he wants to embark on a new career as an author ” specifically, as the author of his own family history. He plans to write the saga of his family, starting from the time of his grandfather, Alexander Finlay Munro. Born and raised in the northernmost village of Scotland, Munro later moved to Russia to take on a job as captain of the Russian soccer team for the 1916 Olympics. Scheduled to be held in Berlin, the Olympics were canceled because of World War I and in 1917, Alexander Munro had to flee from Russia to escape capture by revolutionary Bolshevik soldiers. He came to the United States, raised a family, and his grandson, Sandy, was with old Alexander when he died two decades ago at the age of 95. Shift focus to World War II, when Sandy Munro’s father was killed while serving as a torpedo-bomber pilot off the U.S.S. Enterprise in 1945, shortly before the war ended, leaving a widow and a four-year-old boy. Shift again to the Vietnam era, which was when Sandy served as a pilot for the U.S. Navy as a flight instructor on the East Coast of the U.S. In the mid-1960s he nearly went to Vietnam as a pilot of the Huey Cobra attack helicopters, but his wife talked him out of it, and by 1969 he had decided the war was wrong anyway and got out of the military. So, in 1970, he came to Aspen as a musician in search of a home and a place to play, although he also taught at the local high school and worked at the Great Divide under its founder, Rick Barlow. After seven years, Munro bought the shop, and the rest is local history. Munro said that recently, when his mother died, he inherited a packet of letters written during WWII by his mother and father. And although he has refrained from reading them until the shop sells, he is certain they will give him enough insight into his parents’ lives to fashion some kind of story. Add that to his grandfather’s story, and to his own tales and those of his siblings, his children and his grandchildren, and he’s got a history of five generations of Munros to write about. All he needs now is the financial cushion and the time to permit the story to unfold out of his brain and onto the vacant page. He said this week that he started working on it several years ago but put it aside, and that the receipt of the letters has reinvigorated his desire to write. He called the price “dead cheap” given that it includes a five year lease under what he termed “a very fair rent,” and a store that he said grosses $450,000 a year or so. Although he has had some expressions of interest from potential buyers, there has been nothing substantive. For Munro, it is important that his store remain in business as it is, and he hopes to continue to work there a bit and to teach lessons to students young and old as his time allows. He already has literally taught hundreds to play stringed instruments of various types, and some have gone on to national careers. For example, Lee Satterfield, who learned to play guitar, mandolin and other stringed instruments from Munro, went on to play in Nanci Griffith’s band for a decade. In addition to the lessons, the store has “a certain amount of that celebrity customer thing going on,” and he named patrons such as Leo Kotke, Ringo Starr, Neil Diamond and Bruce Willis as examples, as well as “I’m sure, plenty of tall, skinny rock stars who I didn’t recognize” wandering in to browse after playing a gig at a local club the night before.